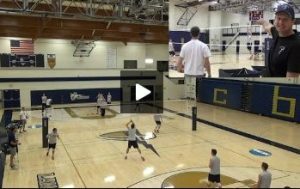 Volleyball Tennis Drill is a movement and passing warm up drill Wes uses occasionally with his team before match days to have a little fun and get the team moving. The drill focuses and improves a number of different skills including but not limited to; passing, movement and reading. We have also included the conversation from the office where the drill purpose is discussed in detail. To see more indoor agility and movement volleyball drills – Go Here!